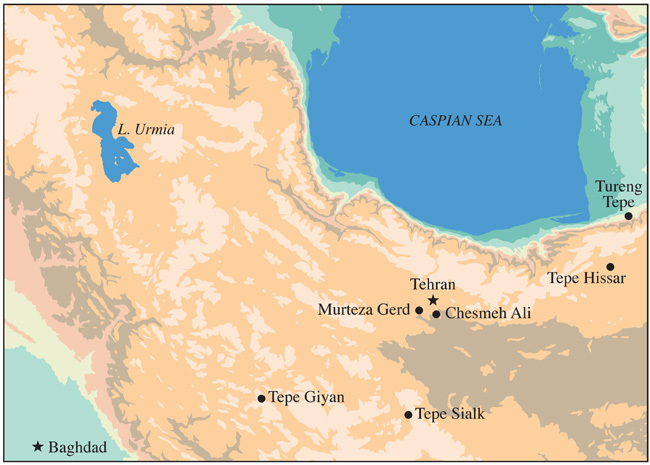 The mound of Tepe Hissar is located near the modern town of Damghan in northeastern Iran, some 360 km east of Tehran and close to the southeastern shoreline of the Caspian Sea. It was occupied continuously from the mid-5th through to the 2nd millennium B.C., at which time its economic importance in antiquity derived from the fact it lay on a major trade route–the Great Khorasan Road–which connected Mesopotamia to the Far East. The first major excavations of the mound were undertaken in 1931 and 1932 by Erich F. Schmidt who subsequently divided the settlement's occupation into three main cultural phases–Hissar I, II, and III (early-to-late)–that, for the most part were delineated by drawing parallels with pottery sequences at other well-stratified Iranian sites, such as Tepe Sialk, near modern Kashan (Schmidt 1937). Reappraisal of many aspects of Schmidt's interpretation of the site are ongoing (see Dyson and Howard 1989). Until the completion of this reappraisal (particularly as it relates to stratigraphy and chronology) the technical data for Hissar's copper-based artifacts presented in this website therefore will retain Schmidt's phase attribution for specific graves and other well-defined contexts.